See the end of this post below for two updates on the Kitty Genovese Case on April 5, 2016 and May 31, 2016. In May 1964 there was an absolutely horrific murder of a young woman in Queens, New York, named Kitty Genovese. Late at night as she was returning home from work, an attacker viciously stabbed her twice and then returned about ten minutes later to brutalize her again and murder her. Winston Moseley was later arrested, tried and convicted for this crime. He remains in jail to this day. At first, the crime did not receive that much attention in the press. Several weeks later, a metro writer for The New York Times reported that as many as 37 witnesses in the surrounding apartment had seen the crime and heard the victim’s cries for help but did nothing to assist or protect her. The Kitty Genovese Case as it came to be known (the link is to a concise summary on Wikipedia of the facts, history and lasting impact), turned into a decades long shameful story and commentary about the indifference of the neighbors who were alleged to have not acted when someone’s life was at stake. Over the many years since this crime, it was also often cited as a symbol for the callousness of New Yorkers. In 2007, a new study carefully re-examined the records and evidence, concluding much of the case’s legacy was wrong. Last year in 2014, on the 50th anniversary of the crime, two books were published and critically well-received about how the reporting was incorrect and how the public’s outrage over her neighbors’ behavior had tragically taken root in US culture. The two books are Kitty Genovese: A True Account of a Public Murder and Its Private Consequences by Catherine Pelonero, published by Skyhorse Publishing, and Kitty Genovese: The Murder, the Bystanders, the Crime that Changed America, by Kevin Cook published by W.W. Norton & Company. On March 14, 2014, Mr. Cook was interviewed on New York radio station WNYC about the case in a podcast entitled What Really Happened on the Night Kitty Genovese Was Murdered? A movie is being currently made about this terrible crime and its aftermath in an attempt to revise the misconceptions surrounding it. 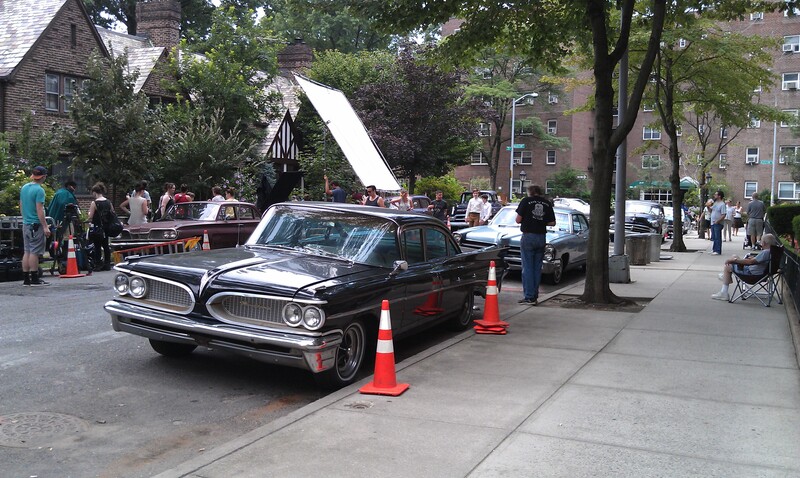 During a walk yesterday morning, I happened upon movie company filming this famous story on location and took a series of pictures wile they were filming. 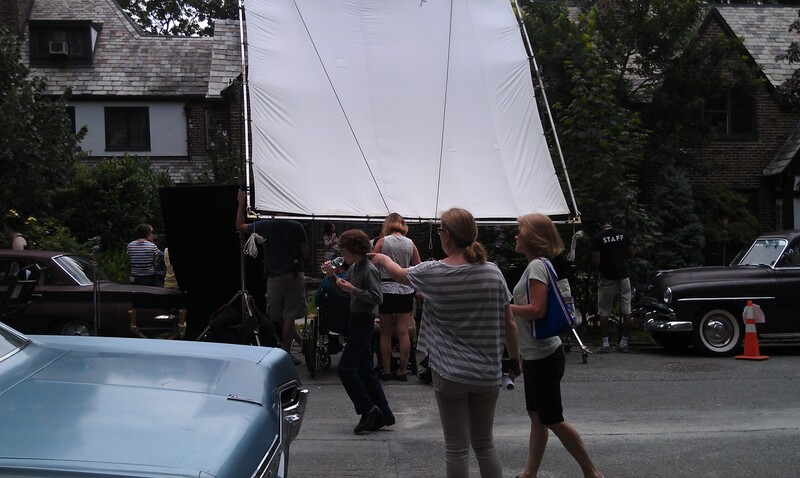 The working title of the film listed on the local notices about the filming posted on the street signs is “37”. I am not certain whether this will be for a theatrical, television or web release. Nonetheless, below are five of the pictures I took as I walked down the street. They are sequenced in the order I took them. The actual filming is going on in front the large white screen in the background. Notice all of the cars are from the 50’s and 60’s. 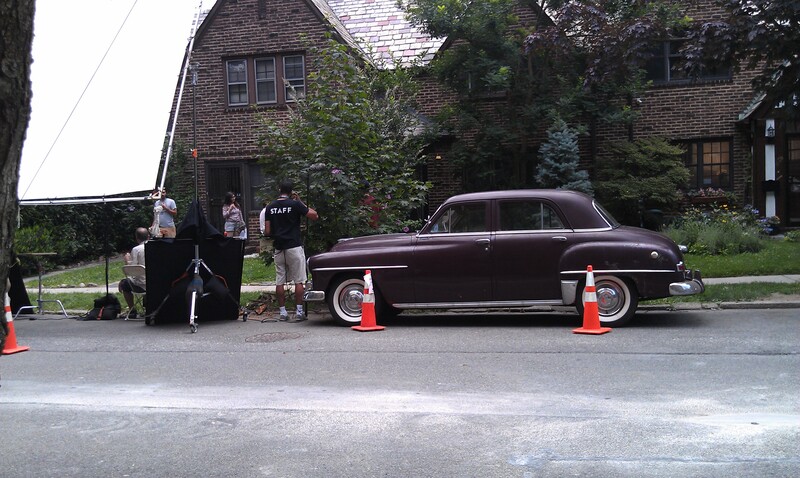 This was taken directly across the street from the filming of a scene in front of a private house. 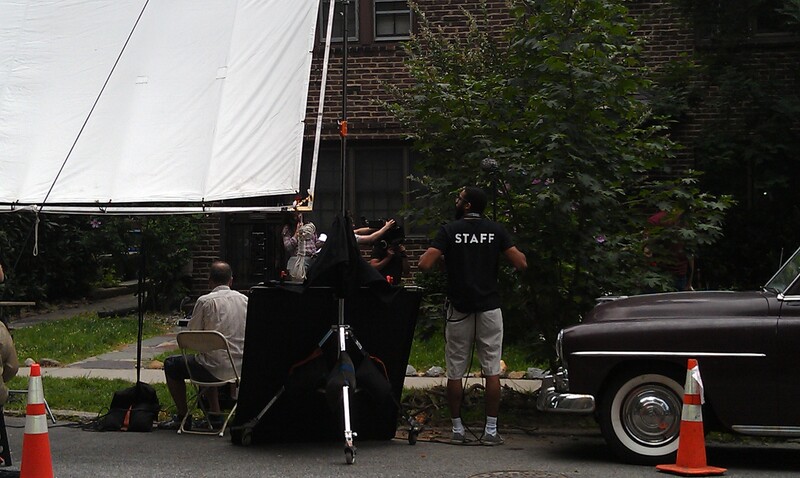 Zooming in a bit closer, the actors and the director where working in front of the row of trees to the right. 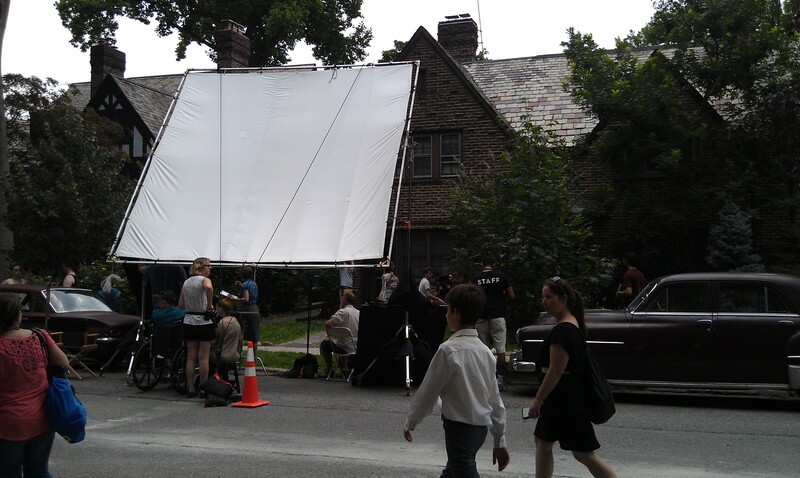 Another view of the filming in progress taken a bit further to the right. A better view of that beautiful old purple Plymouth. I am looking forward to seeing this film when it is finally completed and released. Today’s edition of The New York Times carries an article entitled Winston Moseley, Who Killed Kitty Genovese, Dies in Prison at 81, by Robert D. McFadden. This report concisely covers the original crime, trial, Winston’s 52 years in jail, and the very inaccurate reporting in 1964 and its decades-long consequences afterwards. A postscript well worth reading if you have an opportunity to this terribly tragic story. For a very different and poignant perspective on the Kitty Genovese case, today’s (May 31, 2016) edition of The Wall Street Journal carries a feature about the lifelong work and personal sacrifices made by Ms. Genovese’s brother, Bill, in getting to the truth of what really happened to his sister and making a new documentary film about it entitled The Witness. I very highly recommend reading this article entitled Kitty Genovese’s Brother Re-Examines Her 1964 Murder in Documentary Film, by Steve Dollar. This entry was posted in Books, Movies, and Music, Law Practice and Legal Education, New York, Photo Essays and tagged Bill Genovese, Catherine Pelonero, Documentary About the Kitty Genovese Case, Film Production Crew, Kevin Cook, Kitty Geneovese, Kitty Genovese Case, Kitty Genovese Movie, New York, Subway Fold, The Witness, The Witness documentary film, WNYC. Bookmark the permalink.